This page is about the town in Massachusetts. 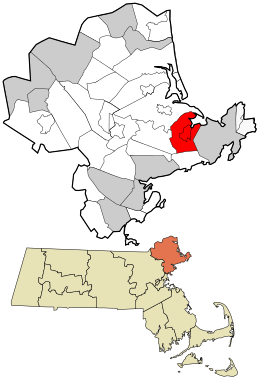 For the county in which this town is located, see Essex County, Massachusetts. For the county in England, see Essex. For all other uses, see Essex (disambiguation). According to the United States Census Bureau, the town has a total area of 15.9 square miles (41.3 km2), of which 14.0 square miles (36.2 km2) is land and 2.0 square miles (5.1 km2), or 12.41%, is water. 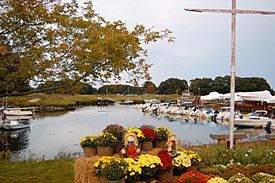 The town does not have any direct access to Ipswich Bay and the Atlantic Ocean, with Essex Bay providing access through the northeast corner of town (the eastern half of the bay lies within Ipswich and Gloucester, with all of the outlet nominally belonging to Gloucester). The central part of Essex lies on marsh land that surrounds the Essex River. Essex River feeds Essex Bay, along with Castle Neck River (which provides most of the town's border with Ipswich) and several creeks, including Walker Creek, Hardys Creek and Soginese Creek. The land that makes up the limits of the town is close to sea level, with a few low hills dotting the landscape. Chebacco Lake and the surrounding wetlands make up most of the southwestern part of the town. Essex's population has increased at a sustainable rate over the last quarter century, so it still maintains a certain rural quality with abundant forested areas, wetlands and open spaces. There are several protected areas within town, including the Allyn-Cox Reservation, a portion of Crane Wildlife Refuge, the Stavros Reservation and the state Wildlife Management Area. The Crane Wildlife Refuge covers several of the islands in Essex Bay, including Choate Island. Essex is bordered by Hamilton to the west, Manchester-by-the-Sea to the south, Gloucester to the east, and Ipswich to the north. Essex is located 11 miles (18 km) northeast of Salem and 33 miles (53 km) northeast of Boston. Though not accessible directly by a major highway, Route 128 clips the corner of town, with exits located in neighboring Manchester-by-the-Sea and Gloucester. Route 133 passes from northwest to southeast through town, and the eastern end of Route 22 is at Route 133 in the center of town. The Ipswich Essex Explorer bus provides weekend service during the summer connecting with the MBTA Commuter Rail at Ipswich along the Newburyport/Rockport Line, as well as providing service to Crane Beach and other nearby attractions. The Rockport portion of the commuter rail line passes through neighboring Manchester-by-the-Sea and Gloucester. As of the census of 2000, there were 3,267 people, 1,313 households, and 887 families residing in the town. The population density was 230.7 people per square mile (89.1/km²). There were 1,446 housing units at an average density of 39.4 persons/km² (102.1 persons/sq mi). The racial makeup of the town was 98.50% White, 0.15% African American, 0.12% Native American, 0.43% Asian, 0.03% Pacific Islander, 0.21% from other races, and 0.55% from two or more races. Hispanic or Latino of any race were 0.92% of the population. There were 1,313 households out of which 31.5% had children under the age of 18 living with them, 56.1% were married couples living together, 7.8% have a woman whose husband does not live with her, and 32.4% were non-families. 26.7% of all households were made up of individuals and 9.4% had someone living alone who was 65 years of age or older. The average household size was 2.49 and the average family size was 3.03. In the town, the population was spread out with 24.2% under the age of 18, 5.3% from 18 to 24, 30.1% from 25 to 44, 26.9% from 45 to 64, and 13.6% who were 65 years of age or older. The median age was 40 years. For every 100 females there were 96.7 males. For every 100 females age 18 and over, there were 97.4 males. The median income for a household in the town was $59,554, and the median income for a family was $70,152. Males had a median income of $48,036 versus $32,000 for females. The per capita income for the town was $31,613. 6.6% of the population and 4.3% of families were below the poverty line. Out of the total people living in poverty, 6.1% are under the age of 18 and 10.8% are 65 or older. There are several active youth sports teams as well as other youth organizations such as the Boy Scouts of America and Girl Scouts of the USA. Since 1994 the Essex Music Festival, offering bluegrass, blues, folk, maritime, and Celtic music, has been held at Centennial Grove at Chebacco Lake in Essex. The festival was called off in 2009 due to Tropical Storm Danny but it resumed the following year; another hurricane resulted in the cancellation of the 2011 festival, and it was not held in 2012 or 2013. Much of the film Grown Ups, filmed in the summer of 2009, used Centennial Grove at Chebacco Lake for filming. 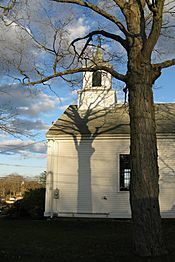 Essex has several churches of various Protestant Christian denominations (Unitarian Universalist, Congregational, Evangelical, Bible Church) as well as a Roman Catholic parish. Conomo is a summer community that is over 100 years old. There are 104 seasonal cottages and year-round homes on Conomo Point, a picturesque summer colony on town-leased land. In 1819, Essex separated from the town of Ipswich on the condition that Essex took care of their poor. To fulfill this agreement, the town of Essex found four properties ideal for a Poor Farm or Alms House in 1825. Since these waterfront properties were not good for shipyards, dry fishing, and farming, these properties had very little value. From the time from 1850 to 1900, the feelings felt toward waterfront property changed. This was due partly to the shortening of the work week and the expanding middle class. The town voted to allow "leasing of rights to build shanties on Town Farm Road. Then another group of shanties were established on Robbin's Island. Conomo Point was no longer populated by only by Essex citizens by 1900.Due to the construction of the railroad in Essex in 1892, Conomo Point was far more accessible to people from close towns. Since the beginning, Conomo Point residents paid real estate taxes on the land they rented as well as personal taxes on their cottages. The town of Essex expected to profit from its land. The rents increased by 25% in 1927 by vote in a town meeting. In 1951, rents were increased another 5%. Then in 1961, rents were raised even higher by 25%. From 1950 to 1970, the town of Essex sought to maximize its rental income while at the same time avoided increasing rental rates. Because of this there was a rapid growth of the Point. Over these years, the town of Essex approved new lots to be leased for the sake of cottage construction. Since the water supplied to Conomo Point from Essex was rusty due to rusty pipe lines, Conomo residents drilled personal wells. Since year-round living never came up before because the water lines were turned off in October, Conomo Commissioners were nervous with these new well constructions. Therefore, they were cautious in granting permission to Conomo residents to drilling wells. Conomo Point Commissioners knew that if the residents of Conomo Point had fresh water year-round then the issue of year-round living would come up. In response the Board of Health stated that no wells could be made on town-owned land. First Congregational Church on Main Street; meetinghouse built 1792. A bell cast by Paul Revere in 1797 hangs in the belfry. Essex, Massachusetts Facts for Kids. Kiddle Encyclopedia.